Uh-oh! The chain has come off at the start of a steep, chalky climb. So I stop – well, more ‘fall off’ because I was out of the saddle when it happened – and put the chain back on as a dozen riders on classic bikes sail past. I get onto the saddle again, stamp on the pedals and the chain immediately comes off for a second time. I take a closer look… and see that the inner chainring has actually snapped. Damn it! There’s a long way to go and a lot of climbs to scale in just the 53-tooth outer ring. This could be tricky. New bicycles with steel frames can be used but they must be assembled with vintage components (gear levers, handlebars, pedals, etc). The adjustment of the rear wheel gears to suit the difficulty of the route is permitted. You get the idea. This ride is for vintage bikes only. You can just about get away with aluminium but carbon? No chance. And if you were to show up with Di2 you’d have everyone else in town choking on their espresso and biscotti. The other big thing that distinguishes L’Eroica is the road surface. 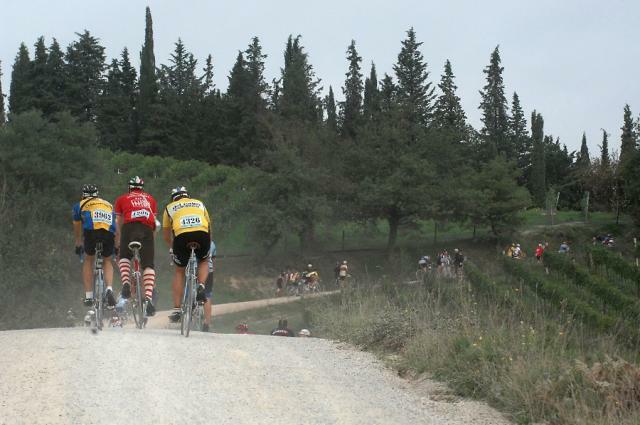 The event goes over a lot of white roads: strade bianche. These haven’t been tarmaced – they’re naturally chalky. They’re sometimes gravelly and quite dusty, sometimes sandy, sometimes smooth and sometimes bumpy. They’re a lot of fun. 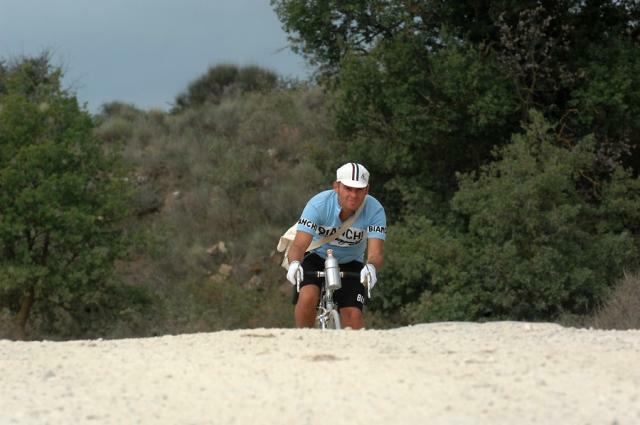 Speaking of fun, that’s what L’Eroica is all about. As far as I could tell, no one was taking this even remotely seriously. If you’re racing it, you’ve missed the point. It’s a chance to ride a classic bike, dress up in retro clothes and have a laugh. 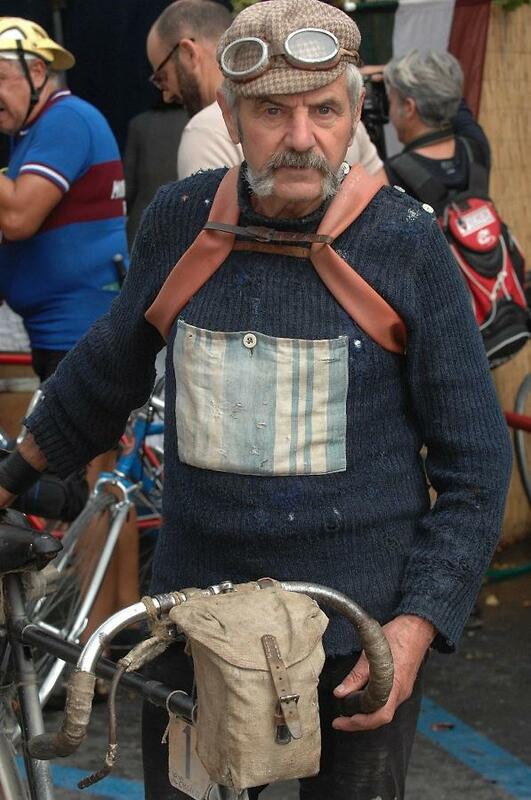 Some people match the vintage of their clothing to the vintage of their bike but for others it's more of a hotchpotch. The main thing is that it falls into the broad category of 'old stuff'. 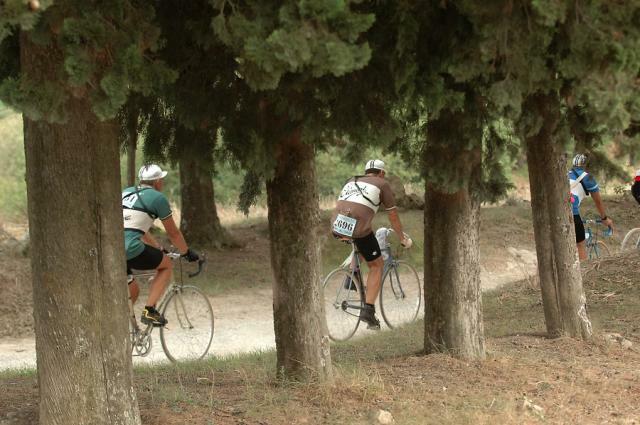 L’Eroica takes place on the first Sunday of October and this year saw the 16th edition. In 2004 there were just 490 riders. In 2012 there were 5,500. It's popular. We arrived in Gaiole on the Friday afternoon with Brooks, the saddles and bags people who are one of the sponsors, and the little town had already been taken over by bikes. There were stalls selling all kinds of vintage kit, clothing and cycling nick-nacks, some trade stands, T-shirt sellers… The whole place has been invaded by thousands of cyclists and there’s a bike festival going on. There are no sports drinks here, it’s coffee and wine. There are no energy bars, it’s cheese and meat. There’s no talk of personal bests, average speeds, wattage or any of that malarkey. You put on a wool jersey and a stupid hat and go for a wander, checking out other people’s bikes as you go. There was the occasional penny-farthing (‘high-wheeler’ or ‘ordinary’ if you’re one of those people who care), and for some reason there was a bloke dressed as the Red Baron who had turned his bike into something that loosely resembled a World War I biplane. We never did find out why. It didn't really matter. There were also a fair few singlespeeds and fixed bikes about, but most people had road bikes from, I’d guess, the 1950s through to the 1980s. There were a lot of beautifully maintained Bianchis, De Rosas and Battaglins kicking about along with a lot of shonky old gates too. As long as they fulfilled L’Eroica’s criteria, no one seemed to care. I hadn’t really known what to expect beforehand. 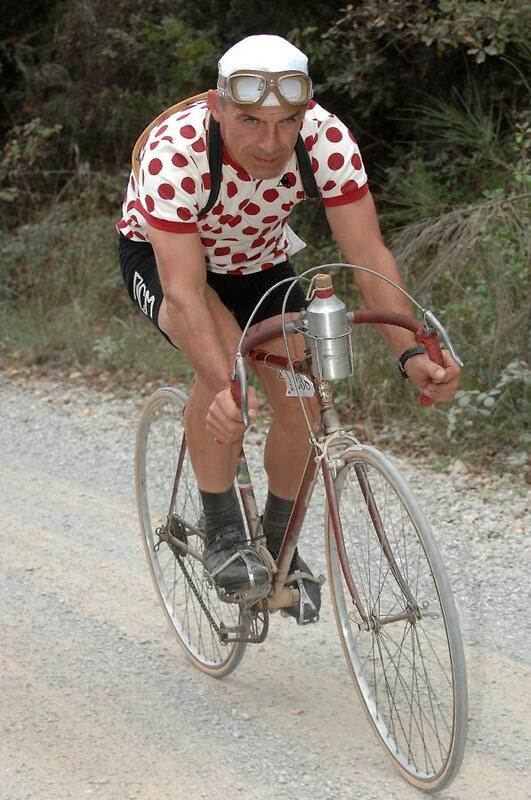 I’d heard of L’Eroica, or course, and seen loads of pictures, but I’ve never owned a vintage bike. Well, I suppose I have, but it wasn't vintage at the time. I was a bit worried that I just might not get it. I mean, putting on some old-style clothing and riding a vintage bike on chalk roads – it’s just bizarre. Turns out, that’s what’s good about it. Brooks had arranged for me to borrow a bike made by Tuder Corsa. No, I’d not heard of the brand either although I did bump into a bloke on the ride who said he was from the Italian town where they were made and that he knew the man who would have built it… which I thought was fantastic. The Tuder Corsa was a cool-looking bike, probably from the 1960s – although I’m no expert. 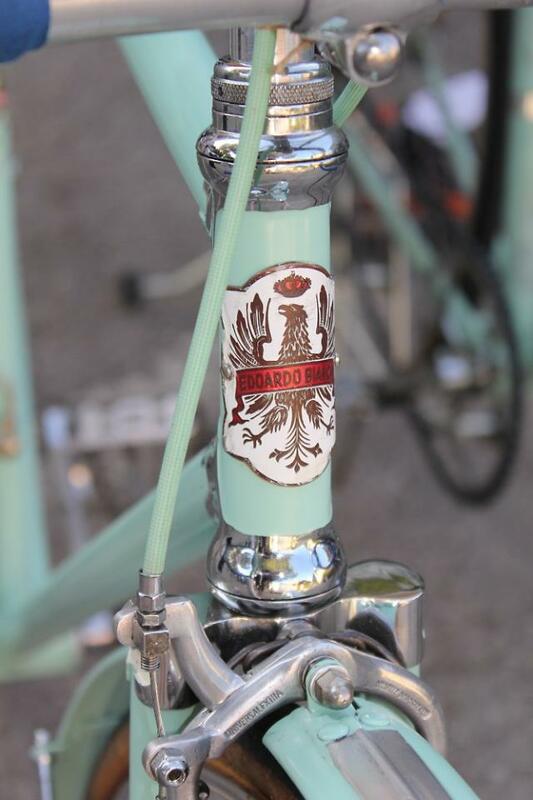 It was slim tubed, of course, with neat lugs and the friction shifters on the down tube controlled Campagnolo mechs. I had 10 non-indexed gears which was normal even when I started riding road bikes back in the 1980s: 53 and 42-tooth chainrings and an evenly spaced cassette at the back ranging from 14 to 22 teeth. There was a skanky old saddle from the 1990s on there so I took that off and put on a leather Brooks B15 Swallow instead. I checked the gears vaguely worked – and they did vaguely work – and that the tubs weren’t going to roll off at the first corner and left it at that. Oh, and I bought some flat-soled vintage shoes too. I’d not known the rule about no clipless pedals – are you getting the impression that I hadn't done much, or indeed anything, in the way of preparation here? – so I needed something that would work with the clips and straps on the Tuder Corsa. 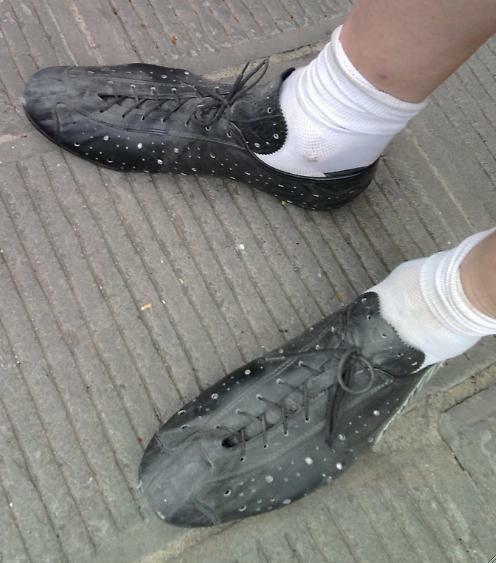 I couldn’t find any shoes that fitted me so I ended up shelling out on some flippers two sizes too big. Still, there was plenty of room down the end for storage; I could have fitted a spare pair of shorts in there and maybe a couple of sandwiches as well. I didn’t see much sense in fine-tuning a bike with rock hard brake lever hoods and bar tape a micrometre thick. What’s the point? Ride this over unsurfaced roads and you’re going to be shaken to bits anyway. Whether the front end is half a centimetre too high or low really ain’t going to make much difference. Had I gone over the bike more carefully maybe I’d have spotted that something was up with the inner chainring. Or maybe it was fine to begin with, who knows? What I do know is that an hour into the ride I got out of the saddle for a climb, put in the power and the chainring snapped. Crunch! That’s a new one on me. Is “snapped chainring” even an expression in the road bike world? Is it a thing that people know about? I Googled it later and there were only 120 results listed, and most of those applied to chainring teeth or bolts. Here, the actual chainring had sheared and the unattached bit was poking out at a rakish angle so the cranks wouldn’t turn. Okay. That's a problem. Two options: first, wait for the tiny service vehicle to arrive, sling the bike on top and call it a day. But I was enjoying this too much. I was riding in the Tuscan sunshine with thousands of other people; I didn’t want to stop and spend ages cooped up in a car the size of a roller skate, gazing out the window at everyone else having all the fun. 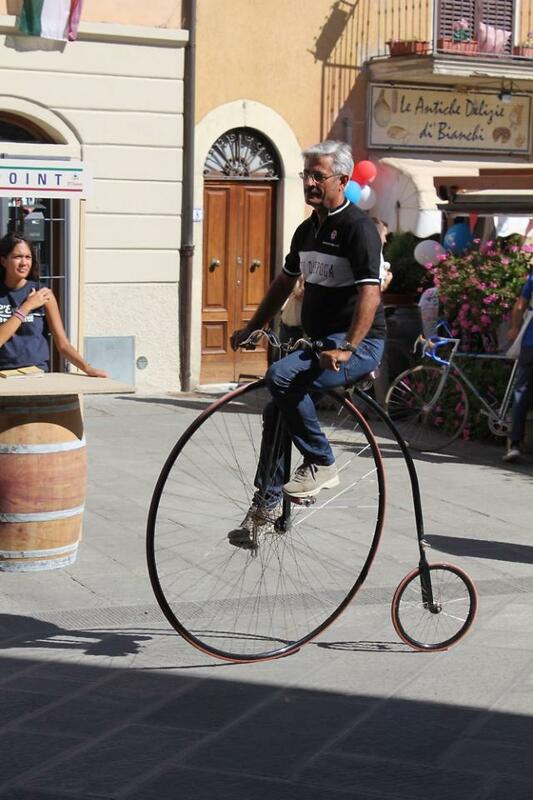 Anyway, this event is called L’Eroica – The Heroic – and jacking it in just isn’t in the spirit. The cyclists we were trying to emulate would break stuff all the time and carry on regardless. 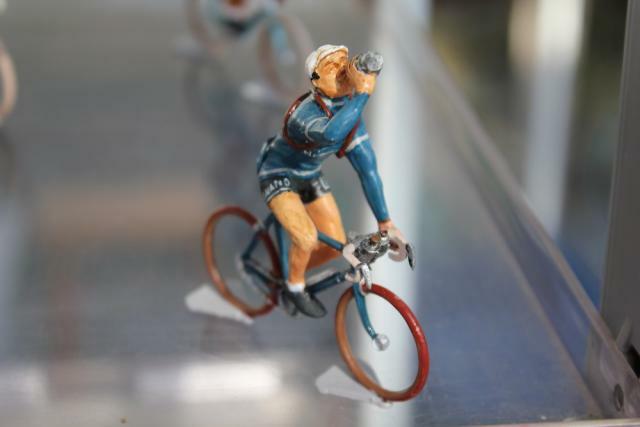 Everyone knows the story of how Eugène Christophe off of the olden days snapped his fork in the Tour de France, walked 10km with it on his shoulder, welded it back together at a blacksmith’s shop and carried on. It would be tragic if I couldn’t handle a snapped chainring on a short, sunny ride in Tuscany. So I took the second option… cope as best I could. Luckily, with the age of the bike in mind, Brooks had given me one of their well-stocked Tool Rolls that I’d taken along, and with a little persuasion and help from my friends I managed to get the bust chainring off. I then folded it up and put it in my pocket, which isn’t something I’ve ever done with a chainring before. This did leave me the problem of completing a pretty hilly ride – about 1,200 or 1,300m of climbing, I think – in just the big ring. Well, it was no longer ‘the big ring’, was it? It was just ‘the ring’. Matched up to the 22-tooth sprocket that meant I’d be booting up the climbs on a 65in gear compared to about 41in on a 39 x 25 set up or 33in with a 34 x 27 compact. But, you know, needs must. Back on the road, the atmosphere was fantastic. People were just riding along chatting, stopping to take in the views… it was just a really relaxed vibe. 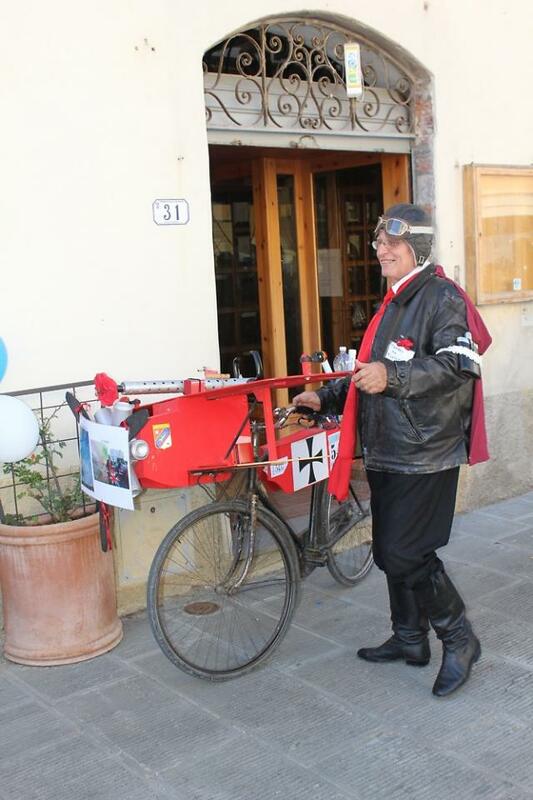 Riders come to L’Eroica from all over the world. There are lots of Italians, obviously, but also plenty of Brits, Germans, Austrians, French and so on, and I spoke to Americans, Australians and Japanese riders too. 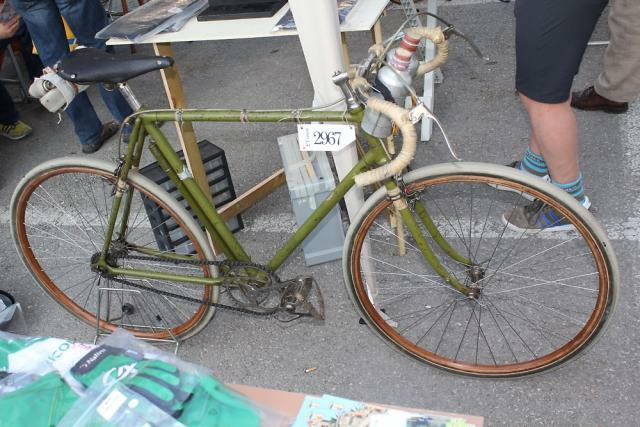 The conversation is easy – everyone is on a vintage bike and every vintage bike has a story. The routes take you through Chianti country and there are vineyards everywhere. The roads aren’t closed to other traffic but apart from the bikes there really wasn’t much about. On the 30+ kilometres (20 miles) of white roads, we must have encountered fewer than 10 cars. The terrain is lumpy but these are hills rather than mountains. On our 75km route the longest descent was about 8km (5 miles) but that included a few flat bits and the same was true of the ascent that came next. It’s challenging, particularly when those hills are covered in loose gravel, and you take on some switchbacks a couple of times, but it’s not the Alps or the Pyrenees. I ruined the ambiance for everyone on the climbs by getting out of the saddle and blasting up them as fast as I could although, in my defence, I really didn’t have much choice. If I hadn’t I’d have just ground to a halt on the steep stuff or spun the rear wheel into the gravel and I don’t do walking – especially not in clown’s shoes. I’d still be out there now. 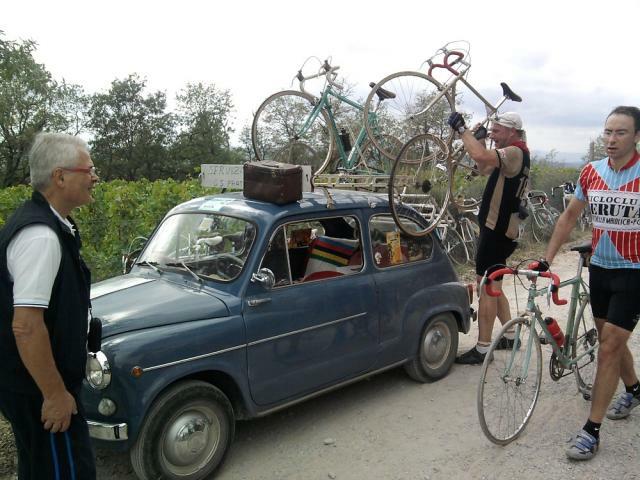 L’Eroica is as much about the stops as it is about the riding. During our 75km we stopped four times - so we averaged 15km stints in the saddle. I think I can safely say that most people could manage that. At least one of those was at an unofficial site set up by some locals giving away ham and wine. It’s a festival and everyone gets involved. You tuck into as much food as you like – bread and jam, cakes, soup, you name it – so you’re never going to run out of fuel. At one stop, we saw some riders who had been riding with imitation rifles on their backs and bullet belts strapped around their waists. One of them threw a rubber chicken in the air and the other one shot it with the loudest bang you ever heard in your life. No one seemed to think that was strange. You might just as well go with it. Back in town the festival carried on. As we waited to get our cards stamped at the finish line, Francesco Moser wandered past, then Pedro Delgado, so this event is getting a seal of approval from former pros. You collect your local produce according to the distance you’ve ridden – we got a big old hunk of cheese! – and crack open a bottle of wine. 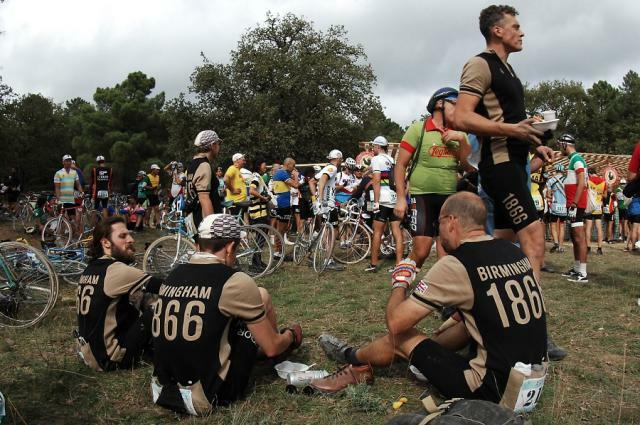 I don’t want to give the impression L’Eroica is one giant booze up – it’s not – but it is about enjoying yourself. It’s good old-fashioned fun. 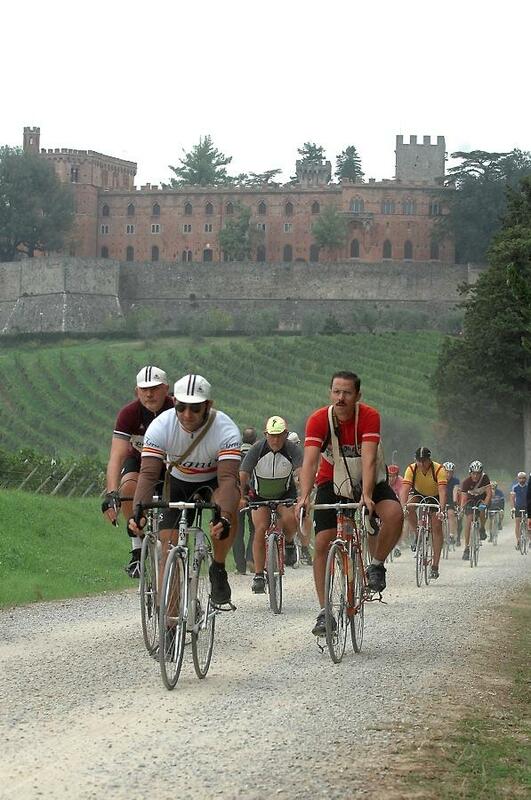 To find out more about L’Eroica visit the website. It’s in Italian but you can get your browser to translate if for you. 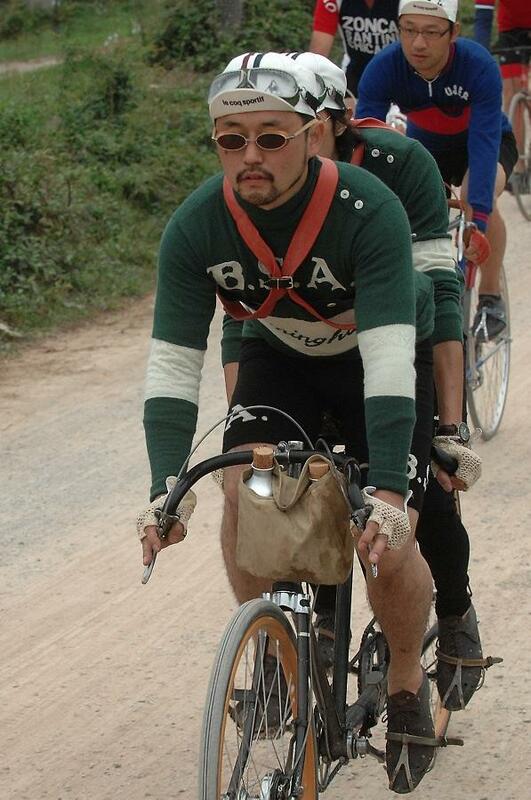 There will be a Japanese version of L’Eroica in 2013 for the first time too. We’ll give you more details on that when we have them. 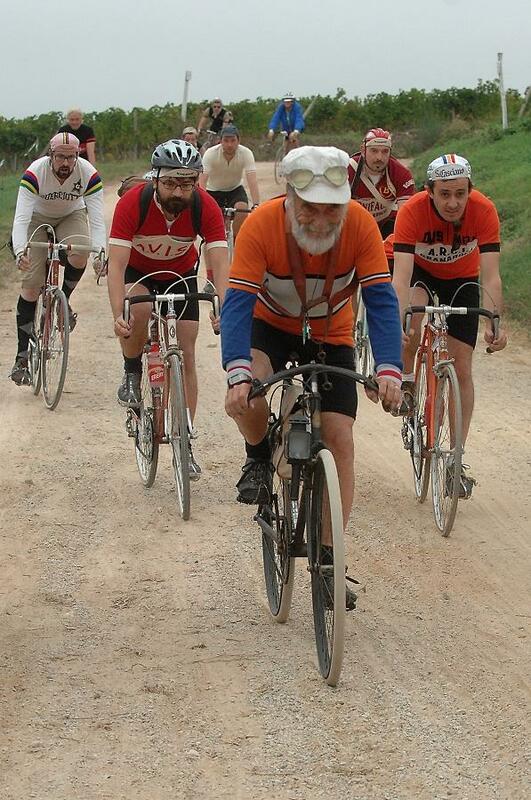 Next year’s L’Eroica will be held on Sunday 6 October. Bianchi have just announced that they’ll be one of the sponsors for the first time and Brooks have extended their sponsorship for the next three years. You should do it. 1 Down tube friction shifters are best consigned to the past except on special occasions. 2 If you’re riding a bike you’ve never ridden before, test the brakes before the first big descent of the day. It could have ended so much worse. 3 1980s bar tape is even worse than I remember it. 4 Contrary to popular belief, you don’t need to ride a zillion miles to break in a Brooks saddle. Mine felt great from the off. I know I only did 50 miles but what’s up with you people? 5 Perfect planning prevents piss poor performance – but winging it once in a while is a laugh too. That looks ace. So much fun!I've got an 80s bike but alas it's got a modern(ish) groupset on it. 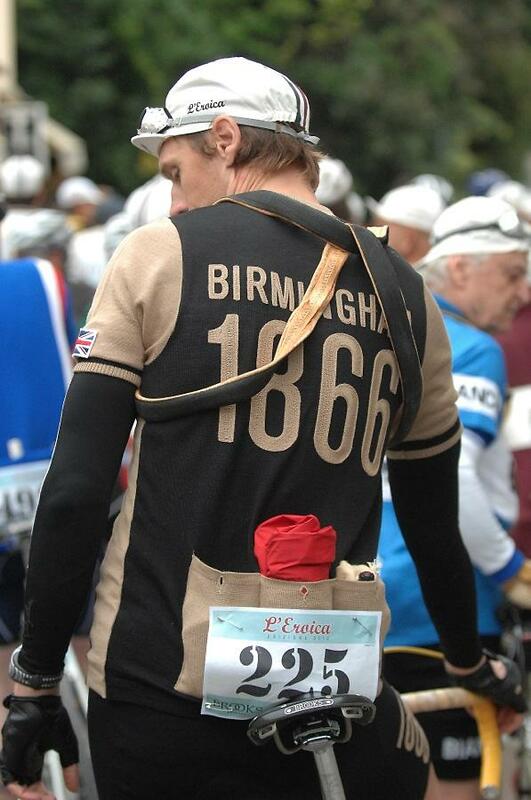 Those Birmingham 1866 jerseys are absolutely gorgeous! I dont suppose they are available to us mere mortals though eh? One of the best days on a bike I've experienced - the 205km is a bit on a monster with 1980s gearing and feet long unaccustomed to toeclips and straps, particularly the climb up to Montelcino and the beautiful ribbon of smooth tarmac on the way back down. The 'bumps' after Asciano have to be 'experienced' - many just walked them! Hi, I know the jerseys were made especially for L'Eroica and I don't think the intention is that they'll go on sale, but I've just fired a mail off to Brooks to find out. You have to have been born in Birmingham. In 1866. Or be able to snap a chain ring with your teeth. Whats the deal with helmets? I was fortunate enough to be entered into this years L’Eroica, and unfortunate enough to break my femur and not be able to take part. Here's hoping that I manage to get into next years (and avoid another injury). Hi, the word back from Brooks is a definite maybe. They're not sure. We'll keep you posted. The bike I ride every day qualifies for this event. Don't know what you're moaning about, I love my downtube shifters and super-comfy 80s handlebar foam. What does the term vintage actually mean? Does that mean the parts have to have been made before 1987 or that the technology is pre-1987? I ask because there are some lovely brand new dia-compe parts which are of the same design as the parts on the bikes above. What does the term vintage actually mean? The only equipment rules I know of are in the story, up near the top (the words in italics). There are no scrutineers checking your bike or anything like that. I'd say it's more a case of doing it within the spirit of the event. Run a couple of retro-style-but-actually-modern components and no one is going to mind too much, I wouldn't have thought. I used a new Brooks saddle, for example, but it was essentially a vintage style. Rock up on some Zipp 808s and you're going to get some funny looks. 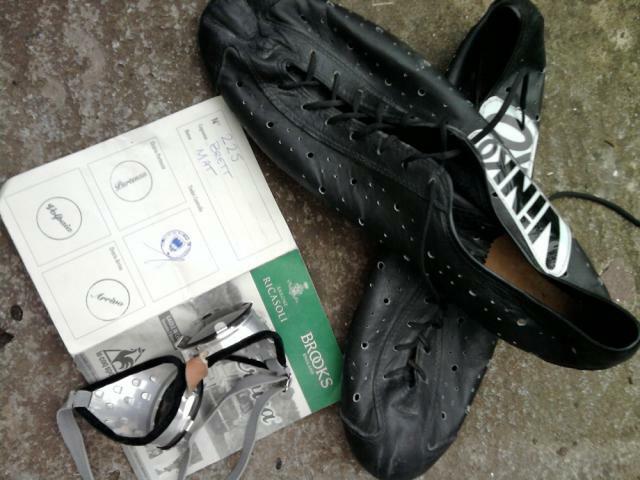 Yes, L'Eroica is all about the 'spirit' of the event rather than judicious application of the rules - there is no scrutineering, but you're only cheating yourself if you ride with modern kit - the guy that danced past me on the climb to Brolio wearing a pair of carbon-soled Sidis and clipless pedals fitted to an old bike frankly looked ridiculous. Besides, he didn't get to experience the joy of hard metal toe clips and soft shoes after 9 hours of riding. In terms of helmets, they're not compulsory as it's not a race, but many do ride with hairnets. The organisers have 'capped' entries at 2000 riders and expect as demand increases, then they may start getting stricter with the 'rules'. puts the london tweed run to shame!!! The organisers have 'capped' entries at 2000 riders. Great review mat, have just returned from a weekend riding the strada bianca out of Radda in Chianti on Cervelos , complete respect to all the riders on L,Eroica vintage and to Cancellara for winning the 2012 early season pro race, some of those roads are steep with a carbon steed and a 39-26! Chapeau .... .
Theres some pretty good hills to get up with the gears you were left with ! I was in the minority in wearing a 'modern' helmet (maybe 15-20% of us) - as given the roads and old bikes I figure its the most likely day of the year that I'll need it, rather than the least ..
And it might be 2000 is the number of 'foreigners' they allow in.. The reason I asked is because I have my Dad's old Falcon frame from the late '60s/early '70s but I don't have any vintage parts to put on it and just wondered whether retro parts which have the exact same pros and cons as the original vintage parts would suit. 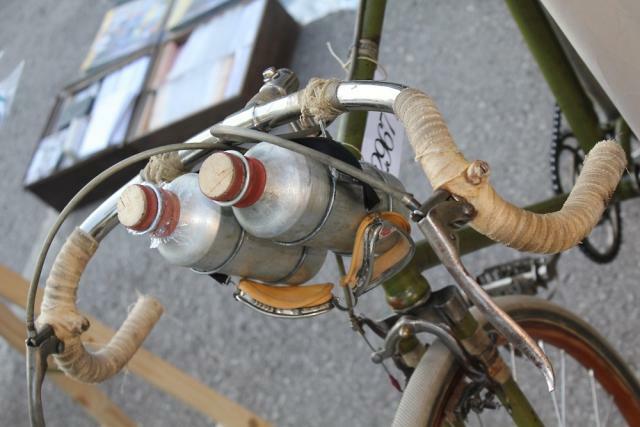 I quite fancy doing L'Eroica in the future. For retro parts, it's downtube/bar-end shifters, non-aero brake levers and toeclips and straps on the pedals - doesn't really matter about the age of them. A less known rule is that if you're not wearing a wooly jersey, then you exclude yourself from a goody bag at the end of the 205km. Another events thats grown significantly is the Retroronde now that they've added a 100km option for the Sunday ride, as well as the Retro-criterium on the Saturday evening. It was a really well-run event with a very friendly atmosphere, plus the bonus is you can drive rather than having the indignity of flying Sleazyjet. I have made an Eroica compliant bike with all modern components including 10 speed groupset. It needs downtube shifters, 22mm or less rims, 32 spokes, brakes with exposed cables, and construction complies with pre 1987 (steel). I Used Officina Battaglin Moristacana frame - I can build these to order.